I am new to this forum but not to boatbuilding. 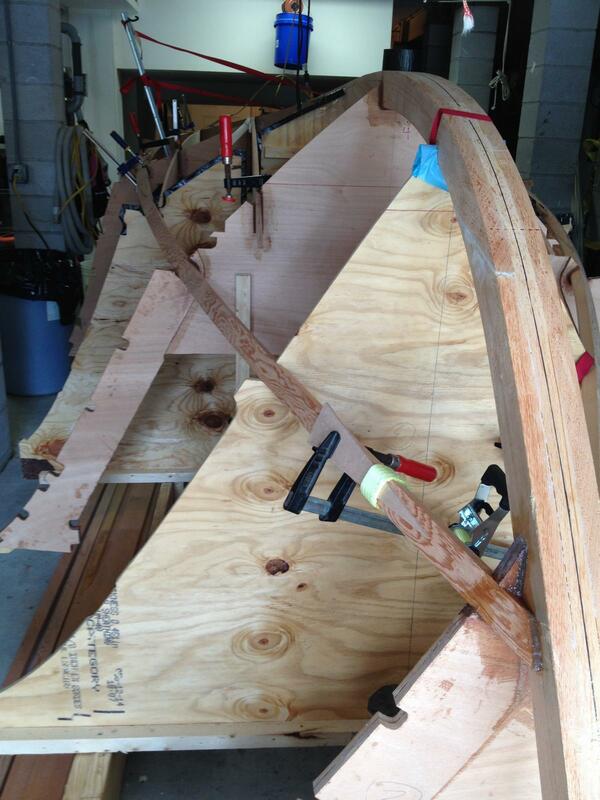 Last february I ordered plans for the Ocracoke 24 and began cutting out parts for the project in May. Things are starting to take shape so I thought that I should share my experience so far. 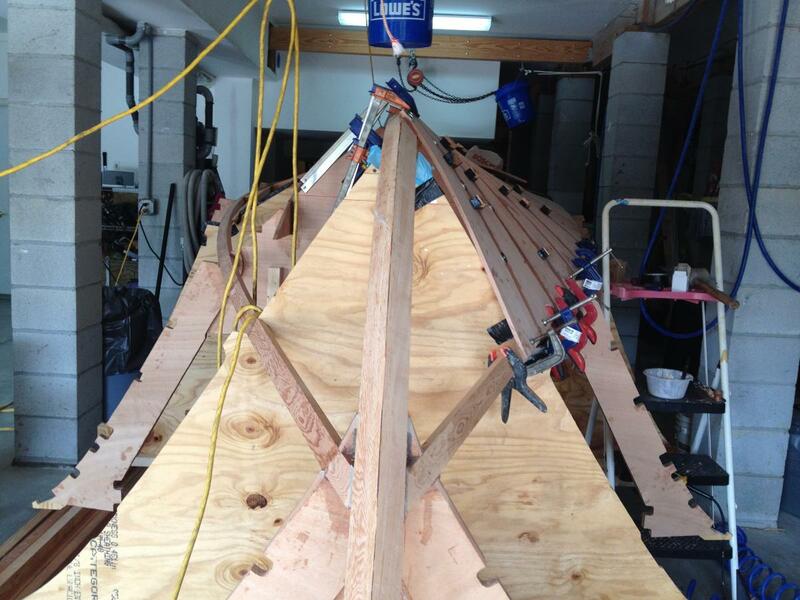 I followed Miyot's building of the same boat with interest. He did a great job and his dedication to posting photos was very helpful. Thanks! I live in Charleston, SC where there is great inshore and near shore fishing and lots of coastal barrier islands and waterways to explore. The harbor can get quite choppy and the harbor entrance is notorious for being like a big washing machine. I think that this design, with lots of bow flare, should be just the thing for getting out there without getting too wet. I've had bigger boats for that purpose but am tired of the expense and maintenance and want something trailerable. 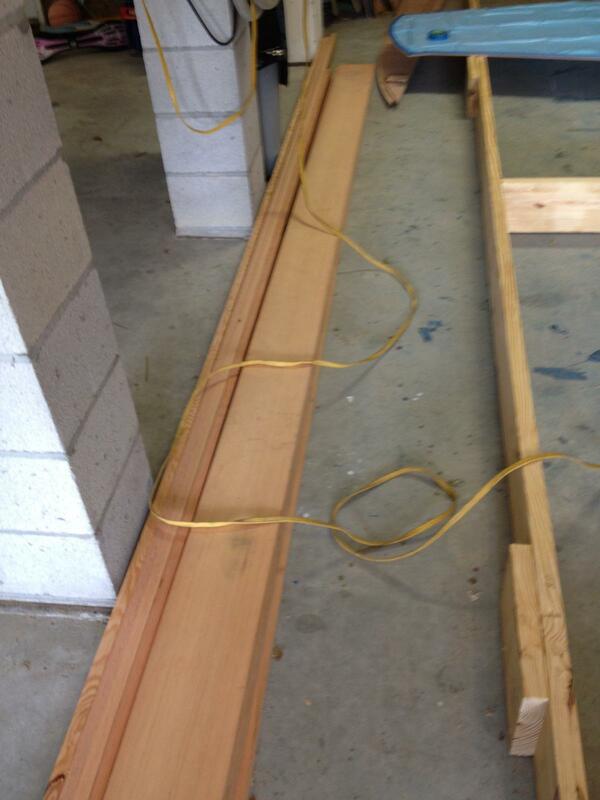 I'm using douglas fir for the keel and stringers, okoume ply for the planking. I plan the full transom version with a 200 Yamaha on a bracket. I will stick as closely to Graham's plans as possible and discuss changes with him. 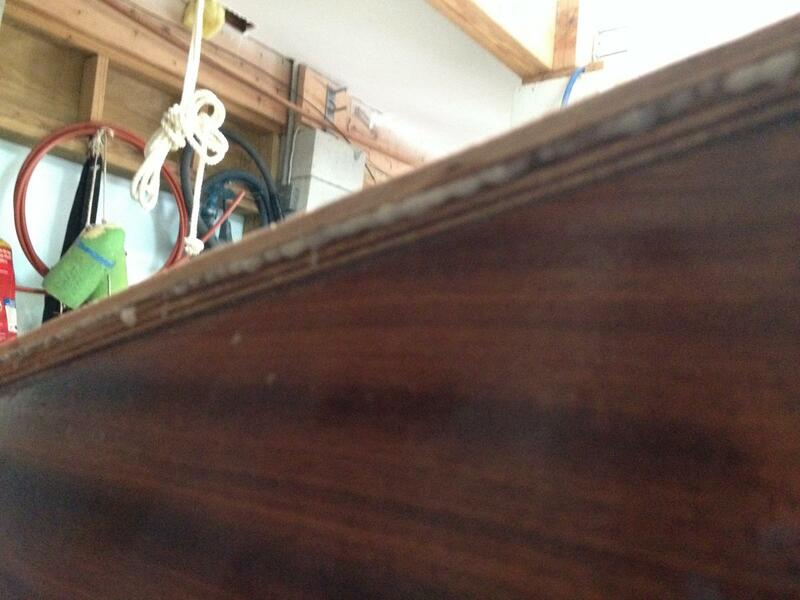 He has already given me advice on reinforcing the transom to support a bracket. Suggestions from members would be appreciated. Here goes, if I can figure out how to post pictures. 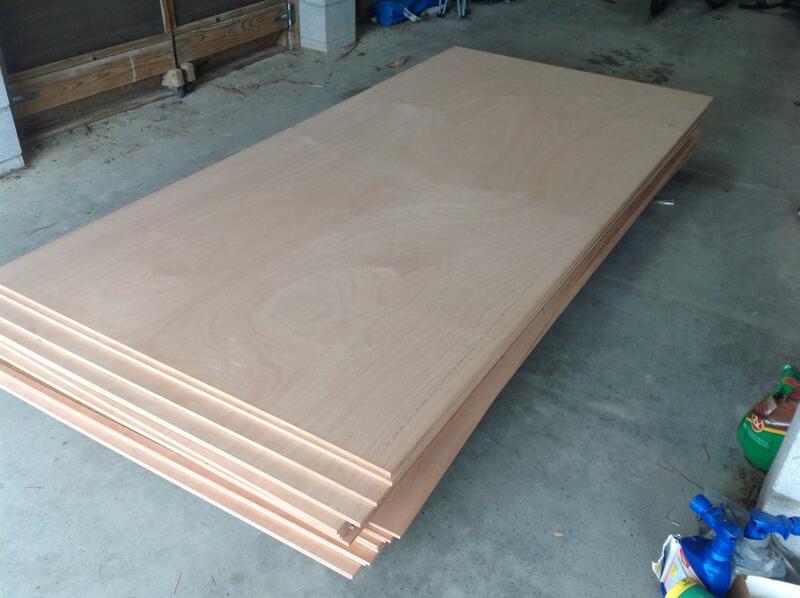 Shown is the starting point...a pile of wood. What part of Charleston are you located? I think that I finally found the upload button so will try to send more photos. 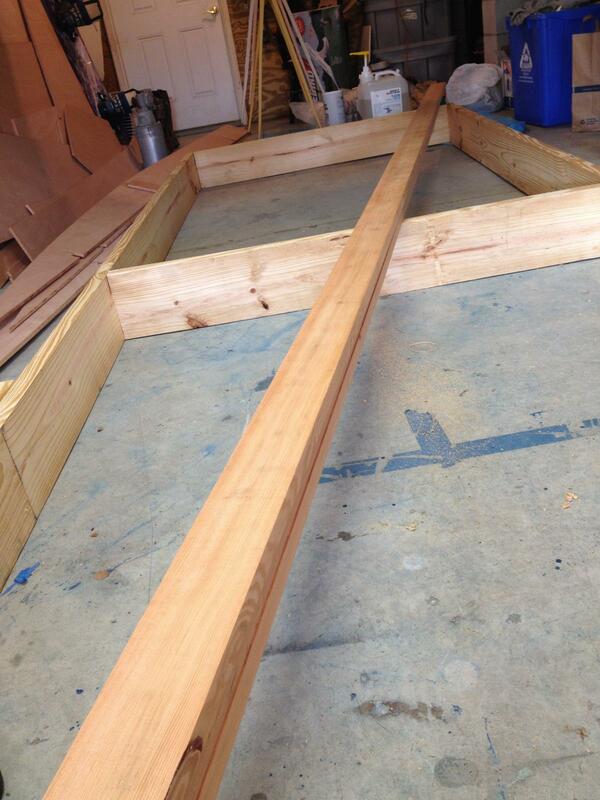 To the left in this photo are 1x3.25x16' douglas fir used to laminate the keel. 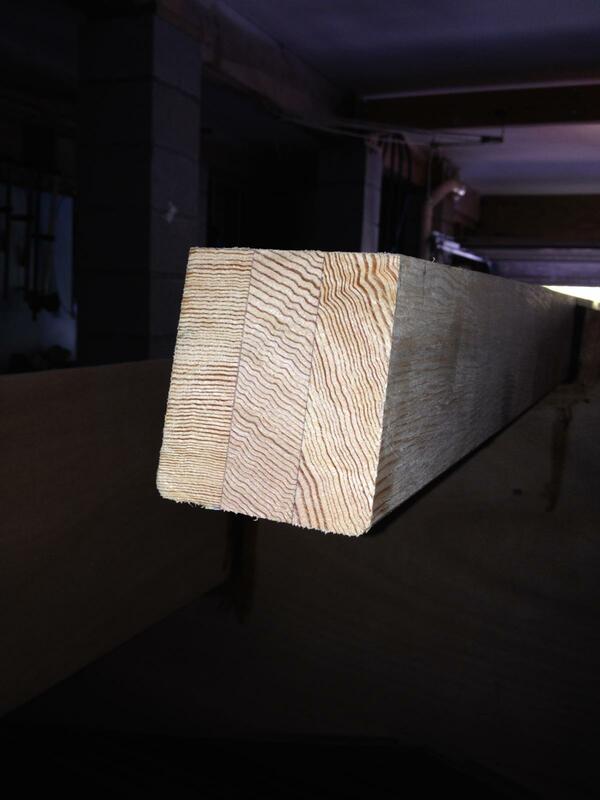 The stem is cut from wider, shorter pieces of the same wood. Parts were traced from the mylar loftings using a dressmaker's wheel and carbon paper. Works great. 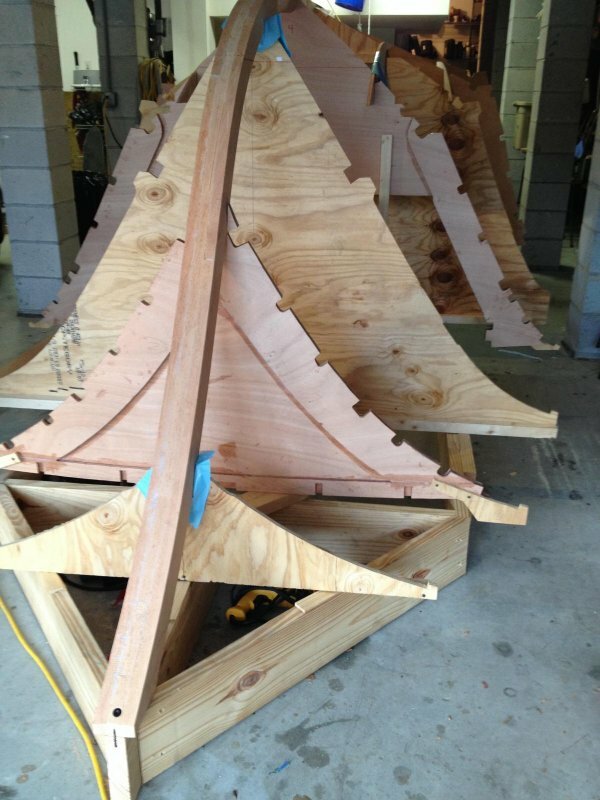 Seen are stem pieces ready for assembly. 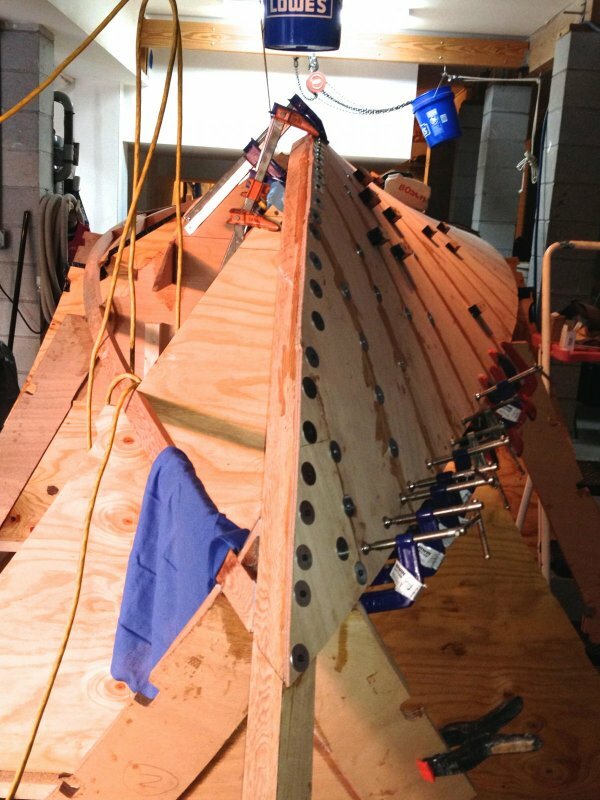 The keel and stem was laminated with WEST system epoxy and a bunch of clamps. This has to be done in one step to correctly bond all parts. The assembly was then cleaned up with a belt sander and a 3/4" round routed in the inboard edge to make glassing easier later. I decided to save shaping until after the setup. 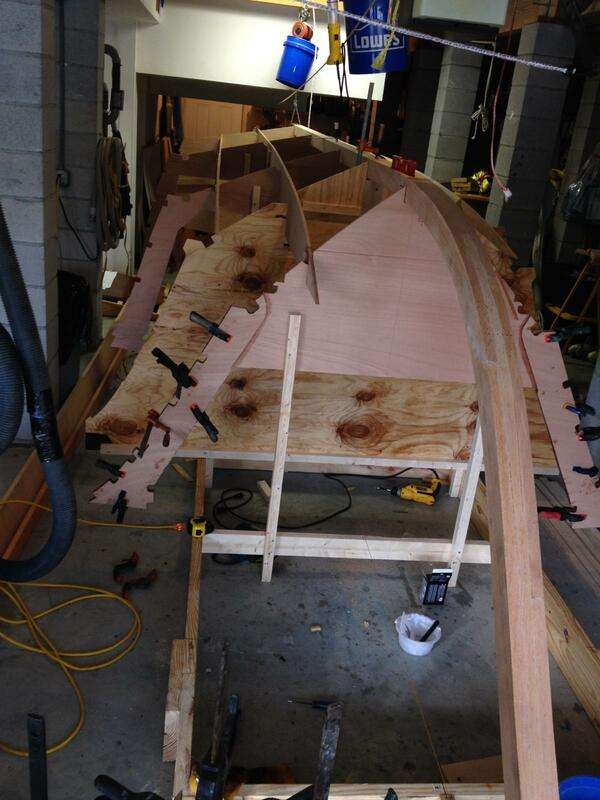 The transom was laminated over a form according to plans. 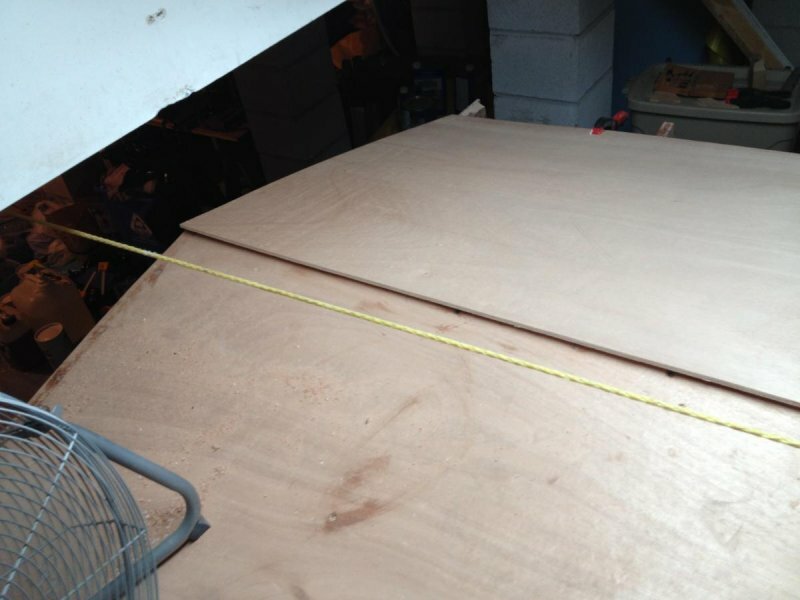 I decided to use a sapale veneer ply on the outside so I can bright finish the transom. 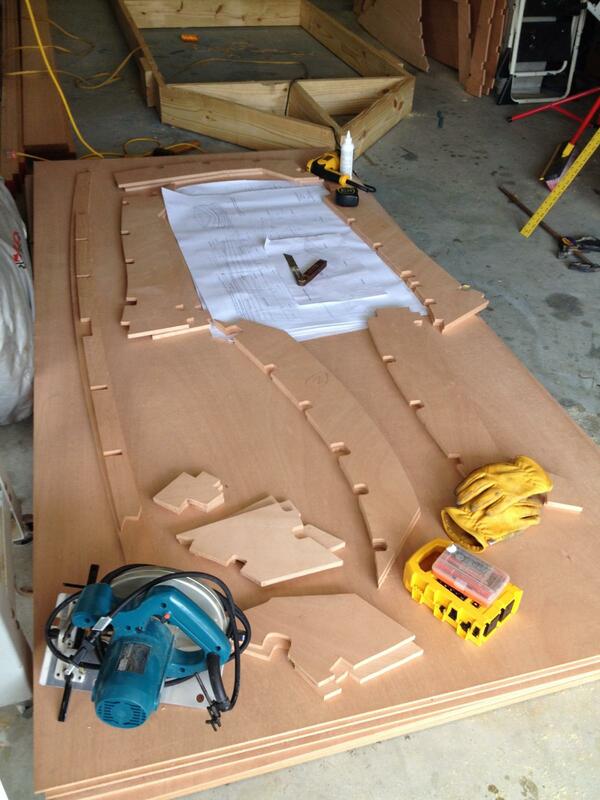 The design has doublers in the middle and edge that were added after the initial lamination of 3 6mm layers of ply. Starting the setup. 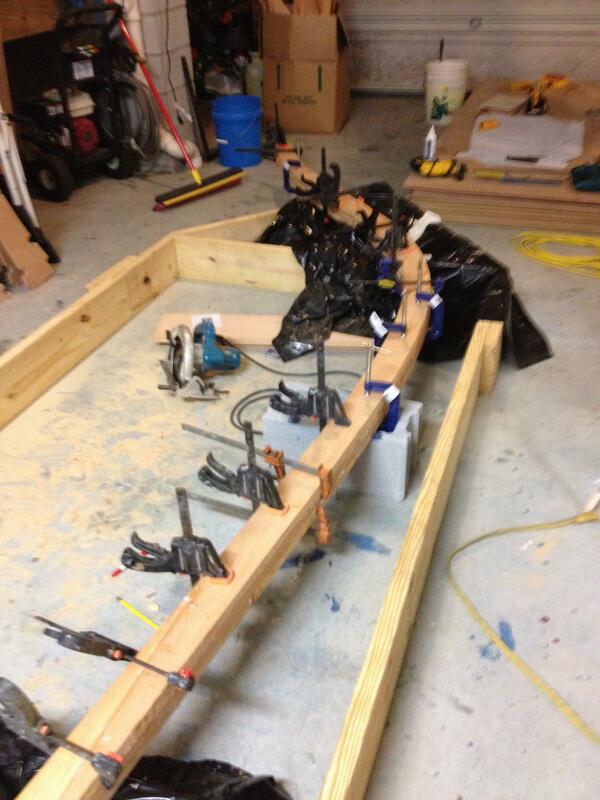 The strongback frame leveled on my garage floor. I'm building this in my garage. I live in a raised house in a coastal flood plain. The garage support columns make it a very tight squeeze but I've measured it twice and I'm pretty sure that I can get it out of the house when finished. It's a bit like a ship in a bottle! 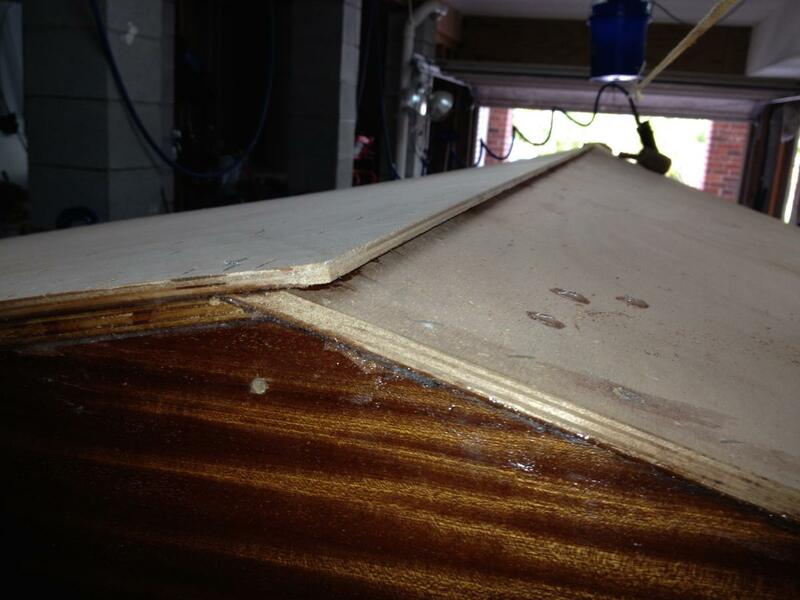 Frames, bulkheads and false bulkheads(cheap, Lowes ply for later removal) and floor stringers were set up, made square to the keel and epoxy glued including 3/4" fillet joints at all seams. 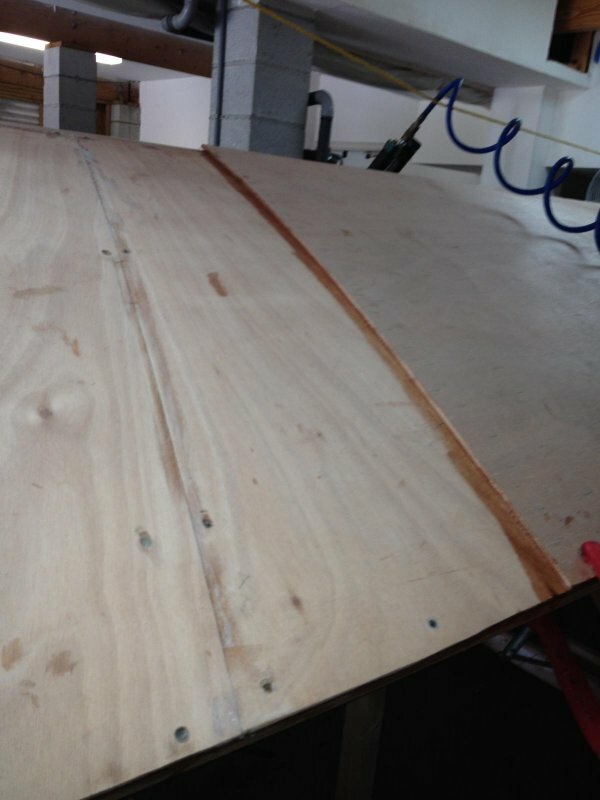 Limber holes along the keel are to be cut later. Sorry for the dark photos...cell phone. 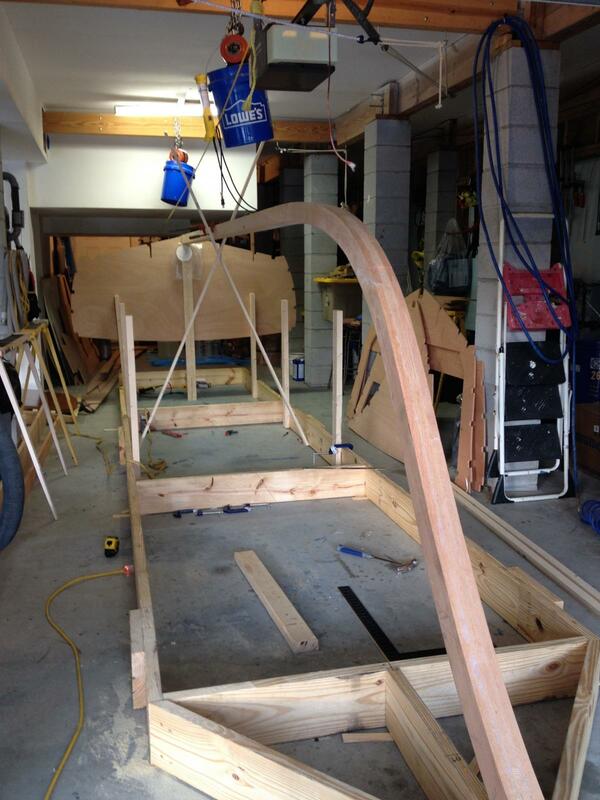 The excess keel length was trimmed and the finished transom installed. 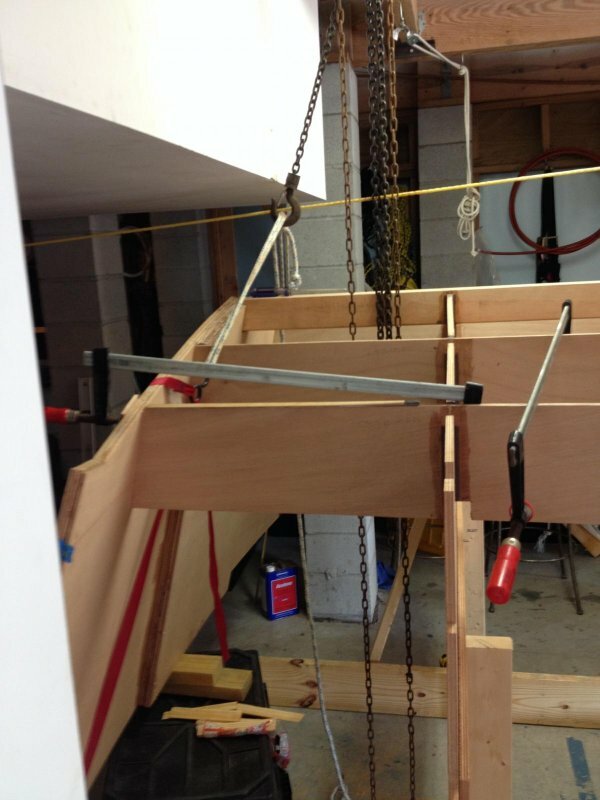 I found it easier to hang the transom from an overhead chain hoist for positioning rather than elevating it on a frame. 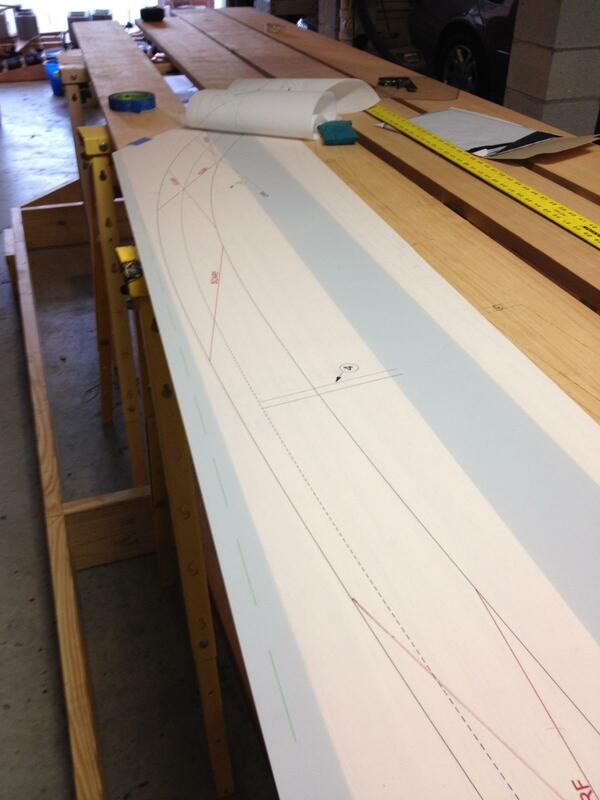 Cutting the keel at the proper length was difficult to calculate. I think that it might hinge on some calculus function that we talked about in college and now forgotten! I made several careful. conservative cuts until it came out right. 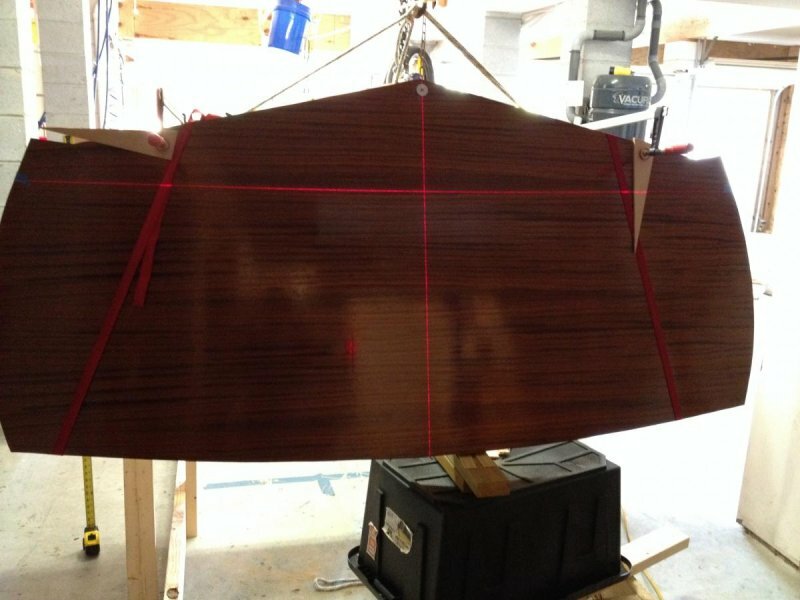 Adios, that transom is beautiful. 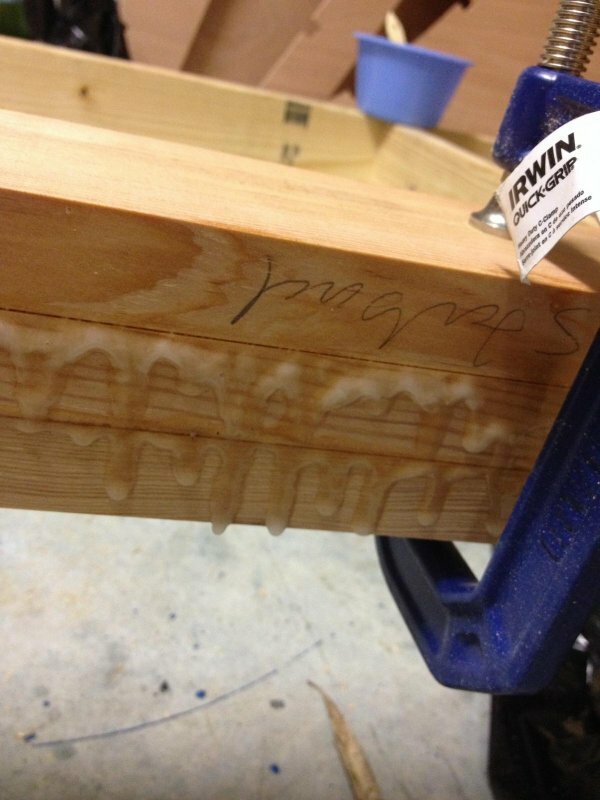 Looks like your making excellent progress. 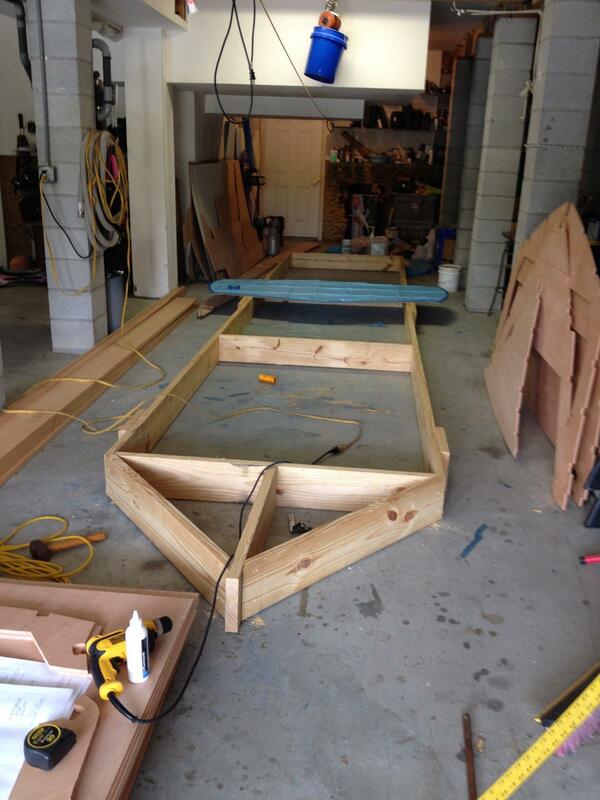 I believe you are going to be happy with your boats performance when finished. It is one solid, well handling boat. Light and easy to trailer. Excellent fuel economy, both for the tow vehicle and the boat itself. I can't say enough good things about it. Solid, fast, nimble. This boat has it all. Hold on when you push the throttle. She will set you back. 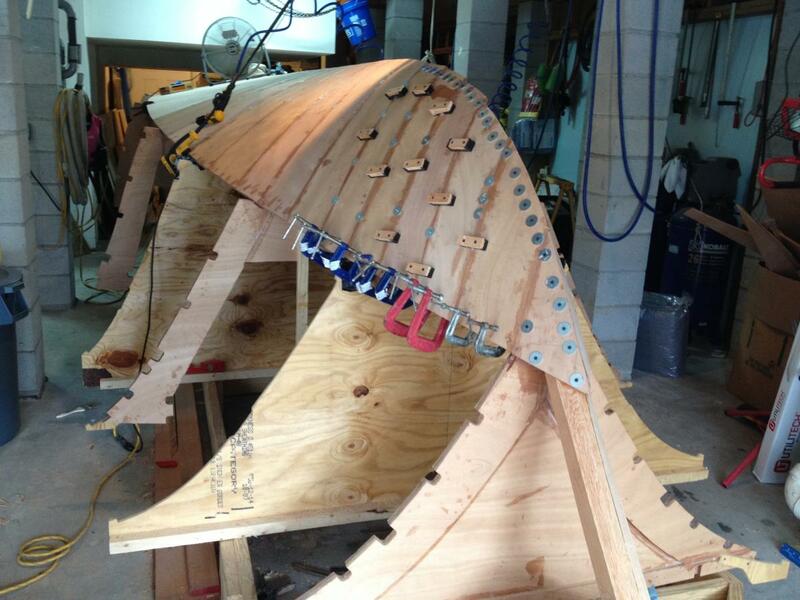 Put her in a hard over turn and she will lean into it, holding you to the deck with centrifugal force. Like a race car on a banked track. Like shes on rails. What can I say, I love the boat. Thanks for the feedback. 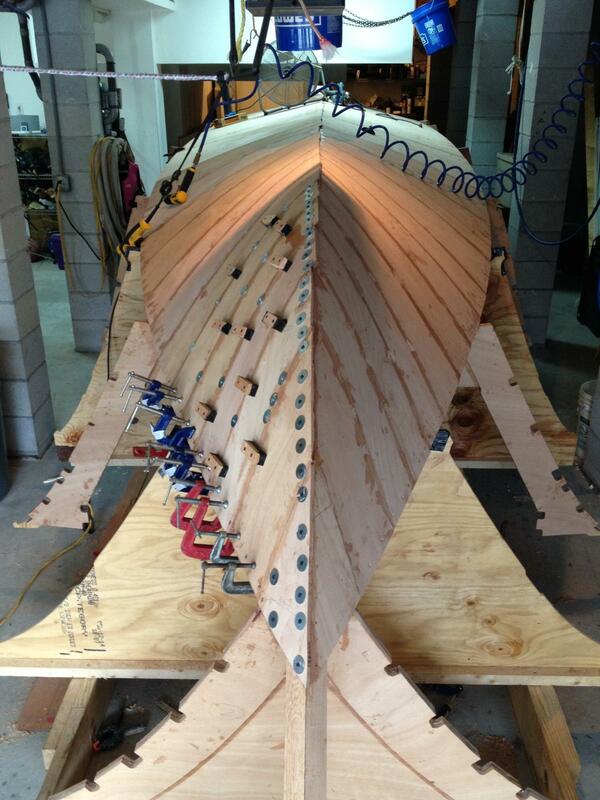 As you know, building a boat this big by yourself is a big commitment. Seeing you finish yours and hearing how she handles is good motivation. Next the chine stringer was installed. 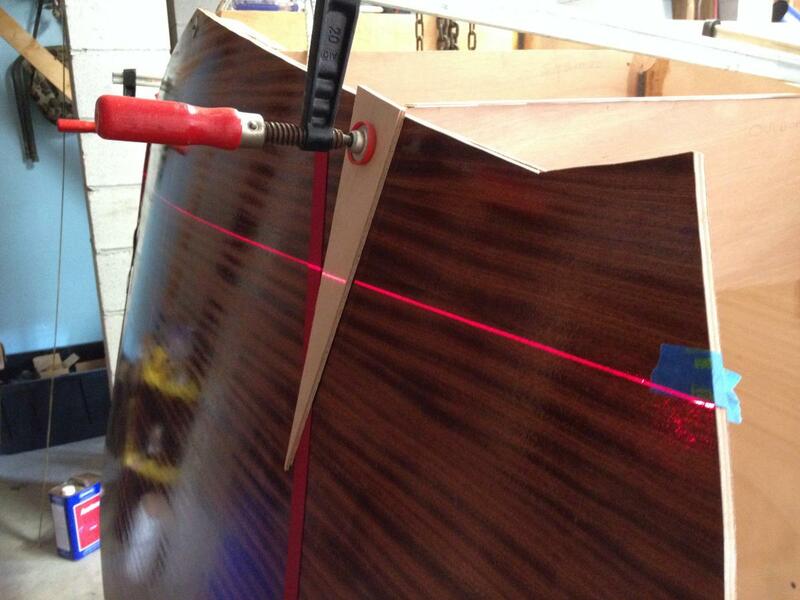 The keel and stem were shaped with a handheld power and then manual planer. 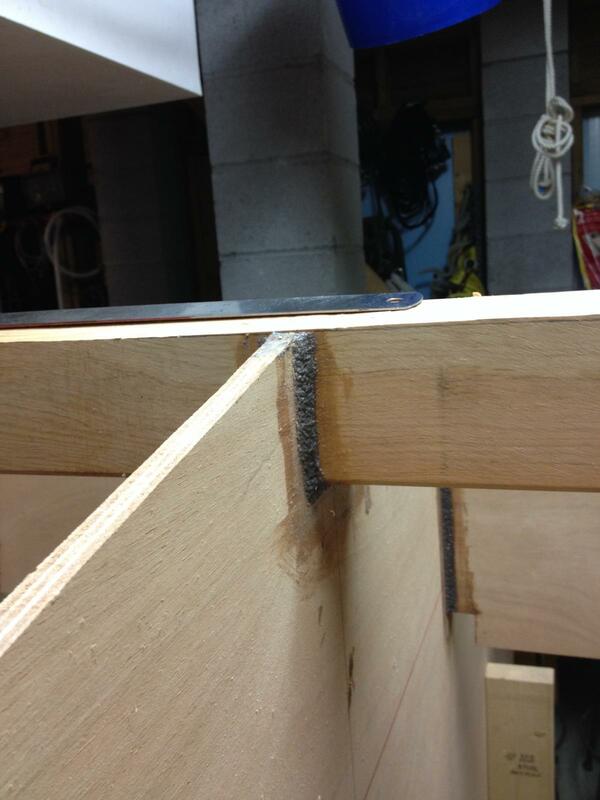 The concave portion of the stem was done with handsaw, wood chisel then #40 grit on a belt sander. 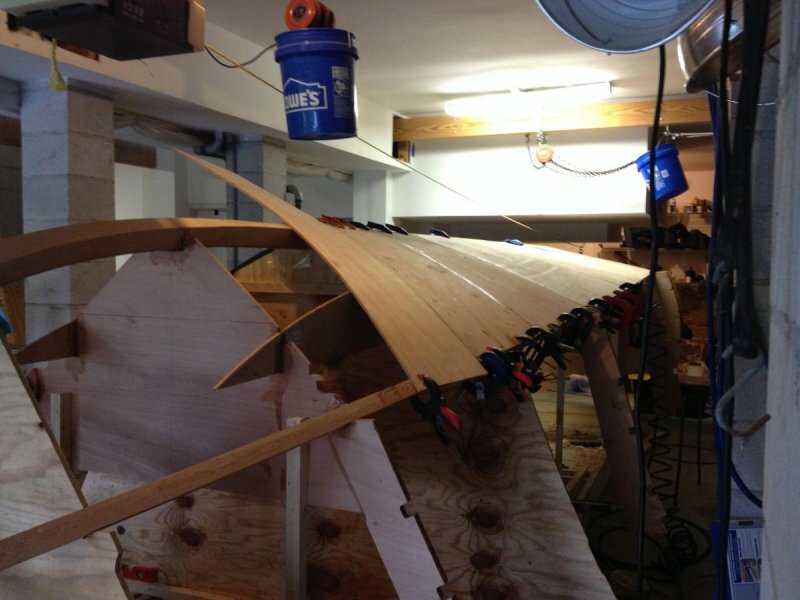 The keel/stem, transom, frames and floor stringers were carefully faired using hand planers and checked with battens until I was sure that the shape was correct. 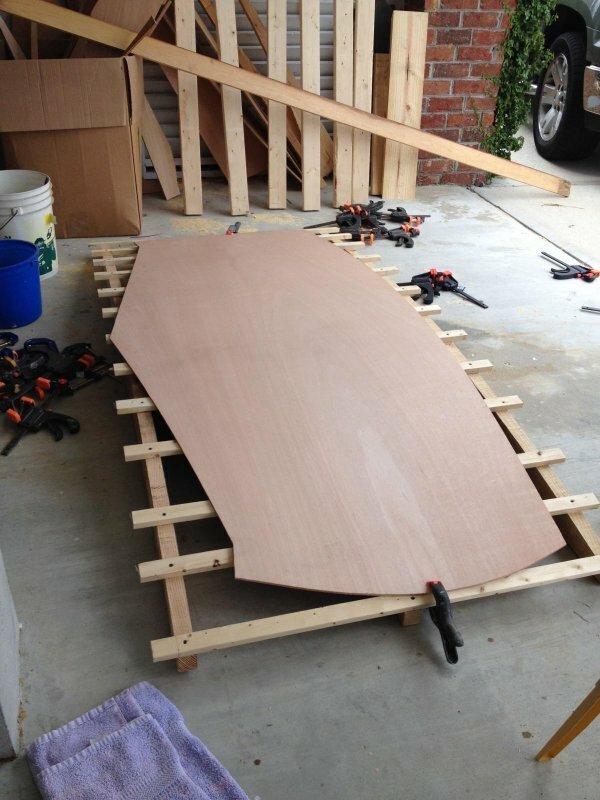 Next step is the bottom planking. The bottom is planked with two layers of ply, one 9mm and the other 6mm. I've just finished the first layer. 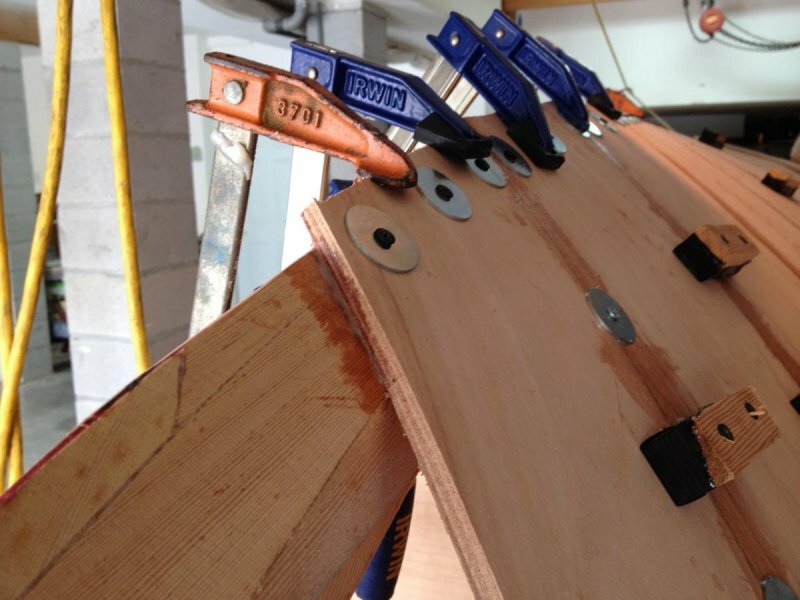 Aft, where there is not much bend in the wood, I used #8 silicone bronze screws. 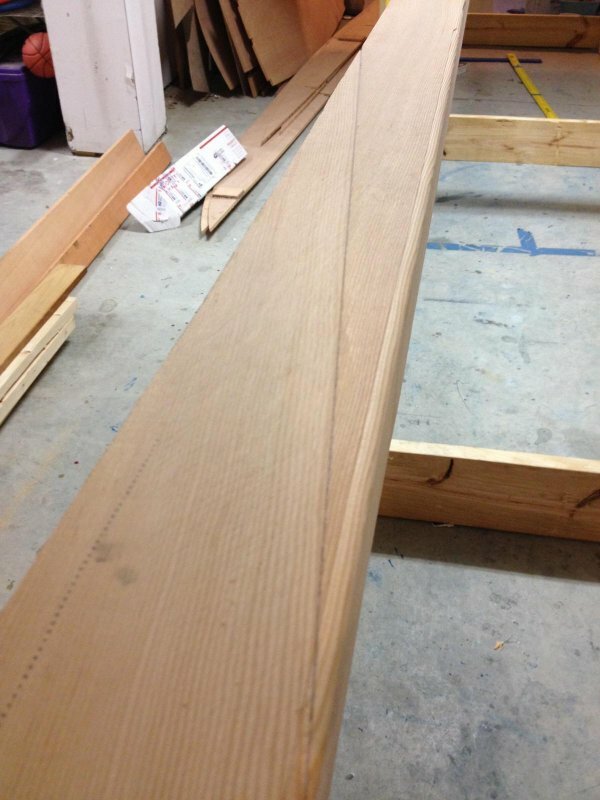 Forward, the planks have to get down to 6-8"wide to make the bend and required fender washers and screws to pull them down flush with the stem and chine plank. 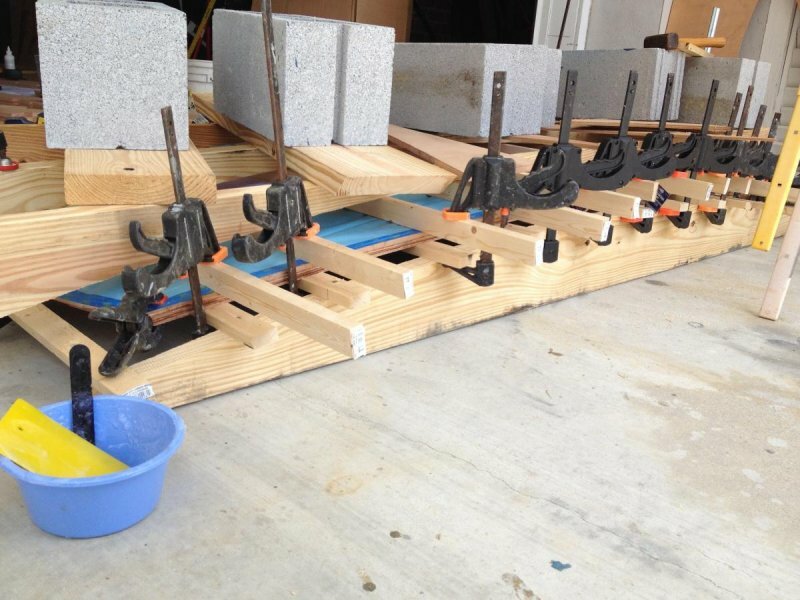 The wooden blocks seen are backed with duct tape for non-stick and are used to pull the plank edges together to make them flush. The other fender washers are doing the same. I'm gonna have a lot of holes to fill when the next layer goes on! Nice job so far. Please keep the pictures coming. I will start my OK 24 next year. Keep track of your hours as I would like to know how long each OK builder has taken. Some more photos to bring you up to date. 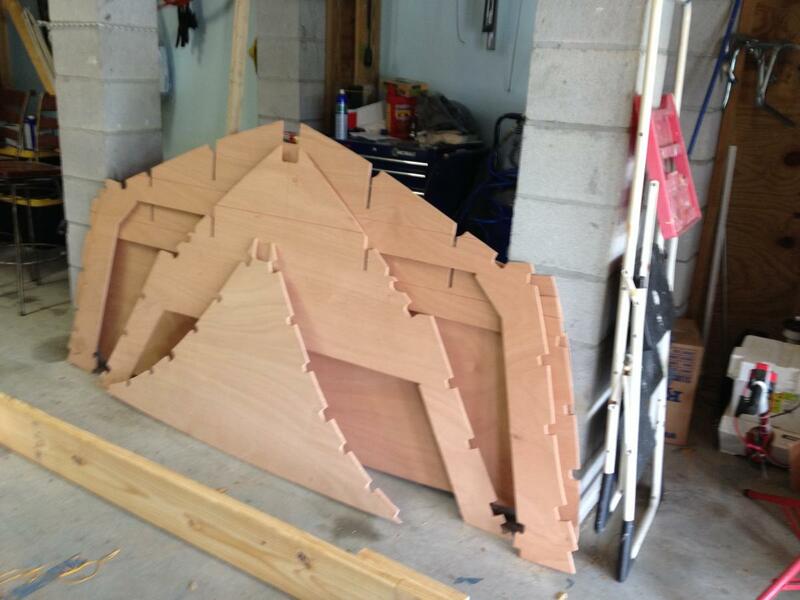 I took all of the screws out and starting cutting pieces for the next layer last night. Hopefully get some work done this weekend. Since my last post I have started applying the second layer of ply to the bottom. 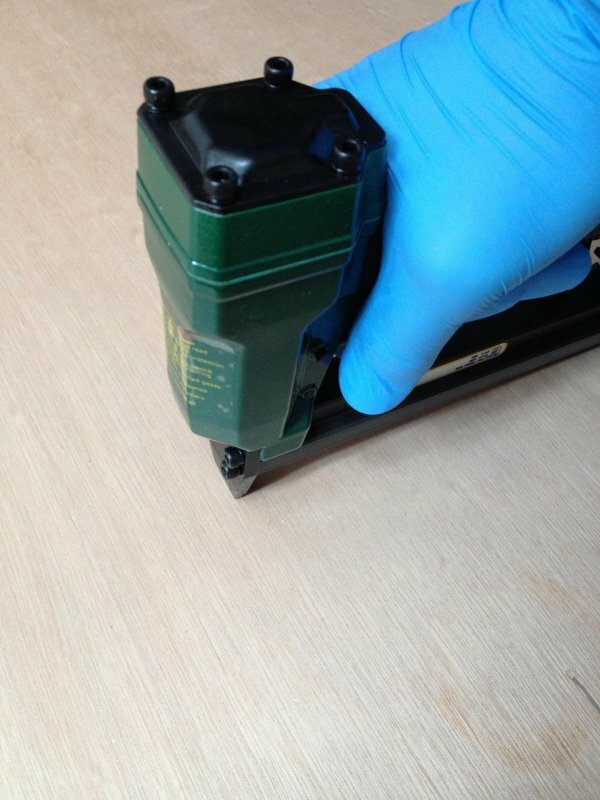 This layer is 6mm thick (the first layer was 9mm) and is a little easier to handle. 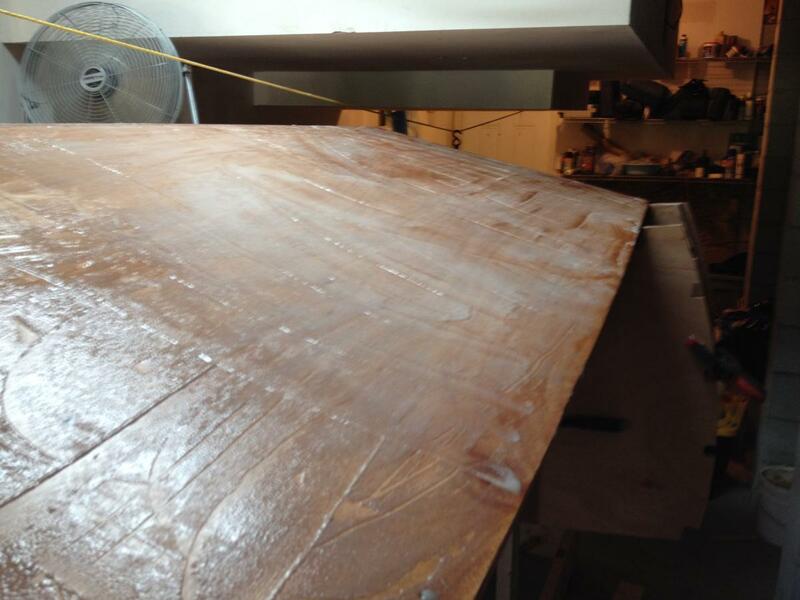 After removing all of the screws the surface was sanded with #40 sandpaper to remove any globs of epoxy. 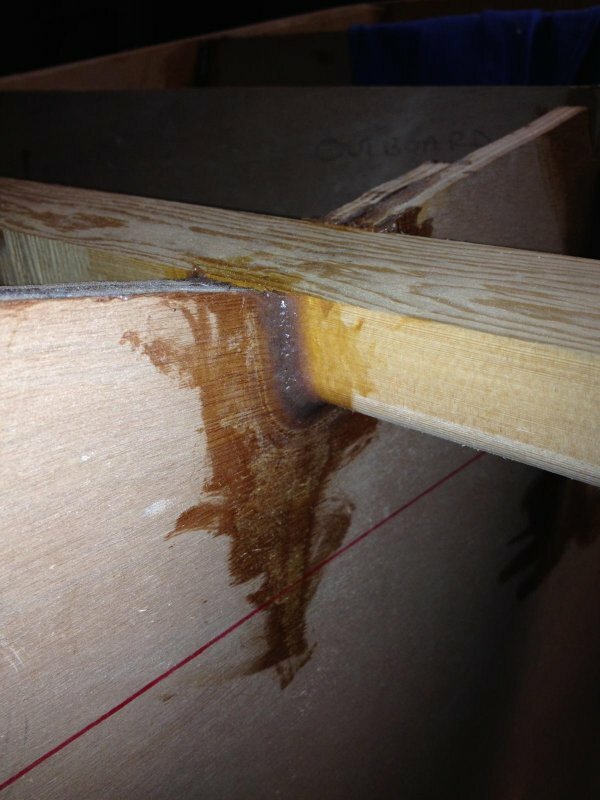 All screw holes were injected with unthickened epoxy then filled with thickened epoxy as the next layer was applied. I had 2 screws break and was able to get the broken pieces out with a broken screw extractor. I decided to use raptor staples and an air gun for the second layer. The piece to be applied was first test fitted. 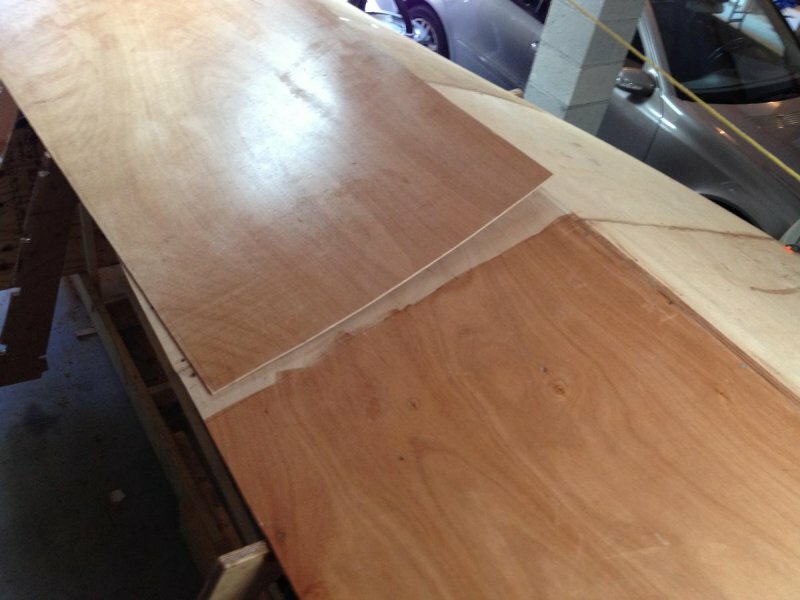 Both surfaces to be bonded were painted with unthickened epoxy, a thickened layer (WEST 403) was then evenly applied to the hull and then the second sheet of ply applied. 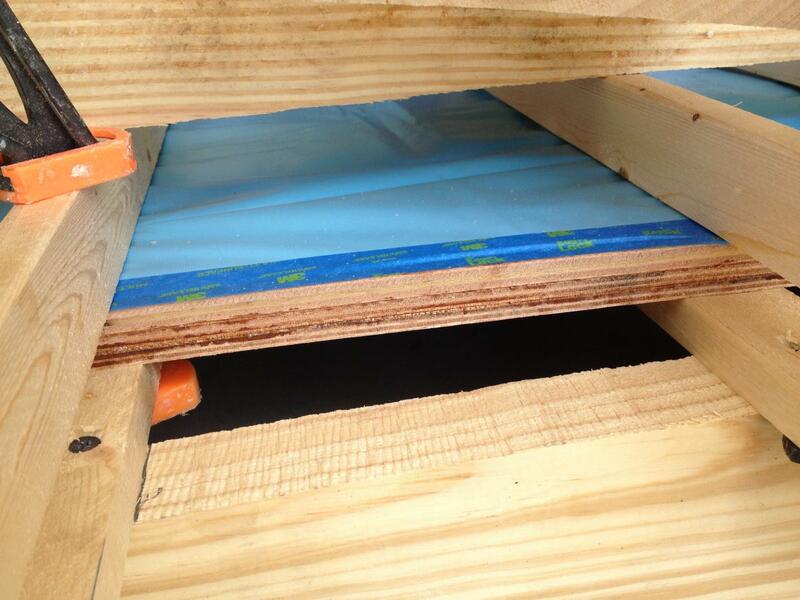 Using body weight and a rubber mallet, air bubbles were tapped out and the board positioned. 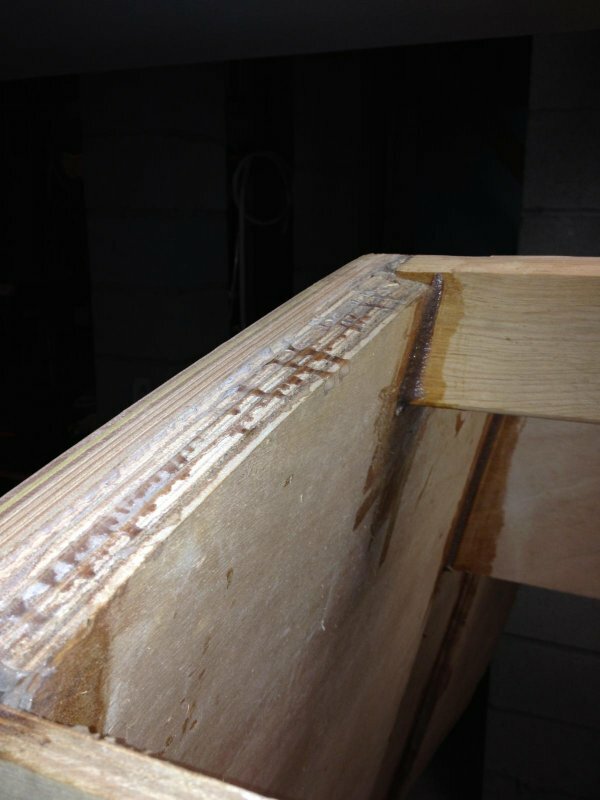 LOTS of staples were used starting in the middle and working to the edges to get squeeze out of the glue. This really works quite well. 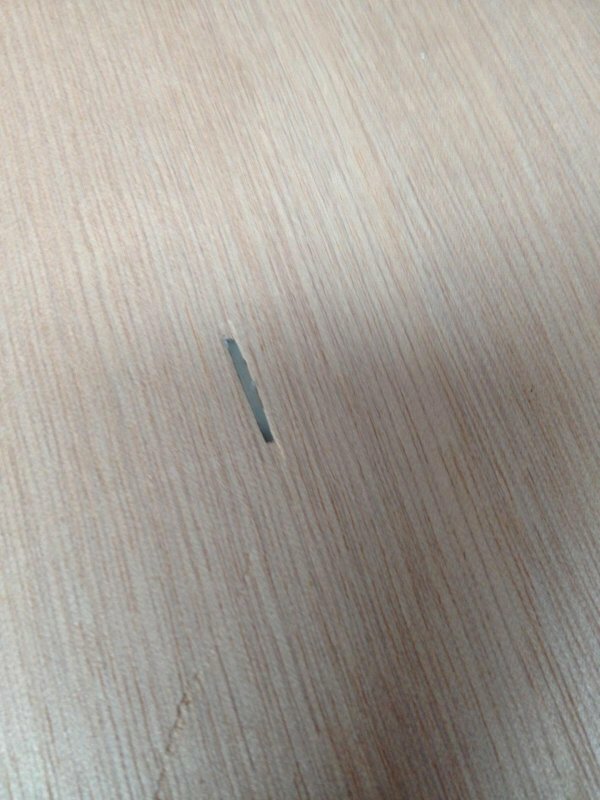 I understand the concern with staples, no compression is obtained, but they do have impressive pull out strength. 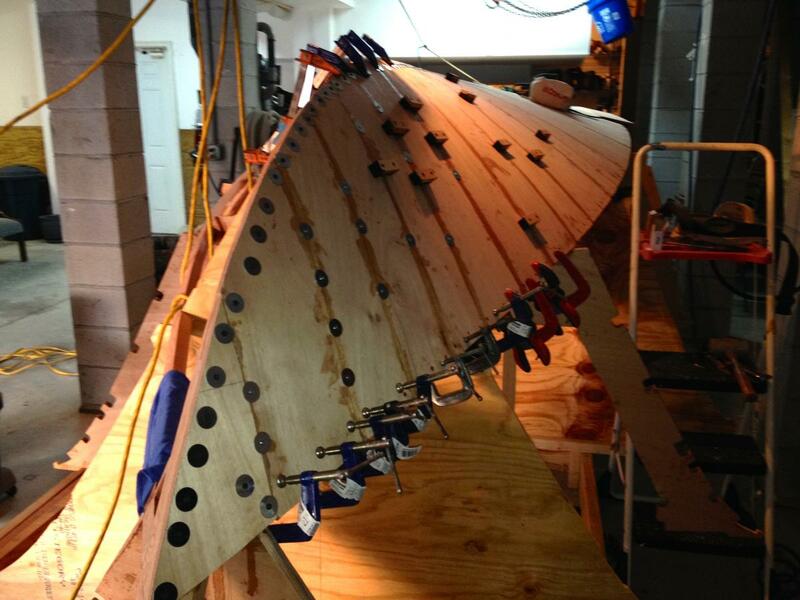 Fairing and finishing will be much easier with not having to patch more screw holes. Sorry for the blurry photos but I sure that you get the idea! 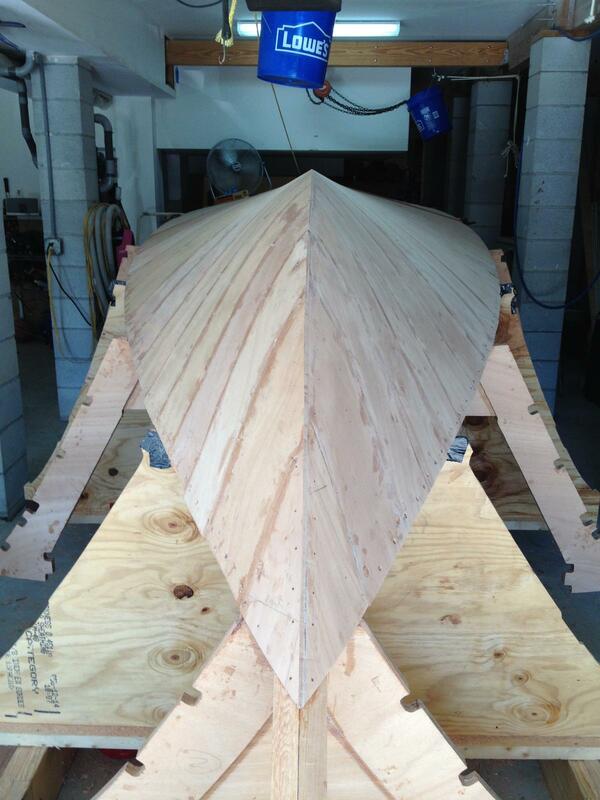 I finished the starboard side yesterday and will work on the port side today. 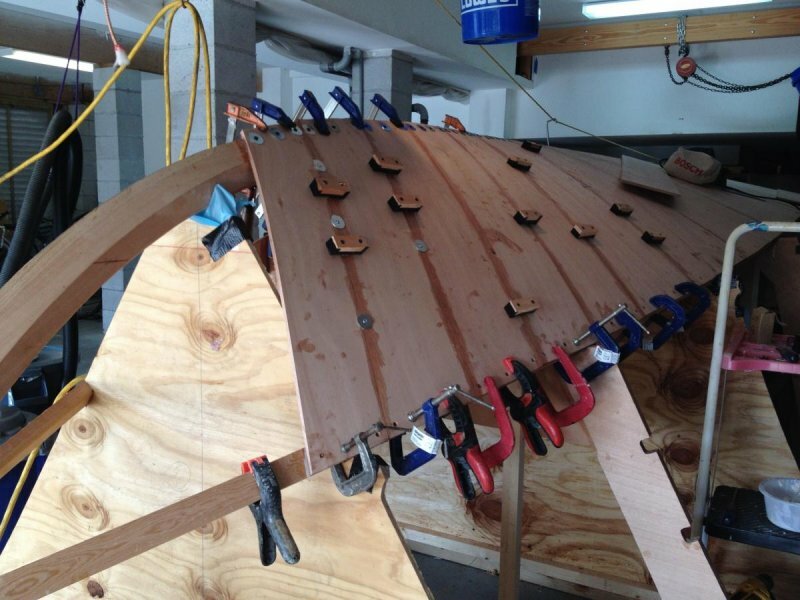 We're having a rainy weekend so, its boatbuilding weather! Moving along nicely at a brisk pace. I have been curious about those Raptor staple/brad fasteners for a while trying to see if I could cost justify the tool. The staple gun is expensive. I paid $ 215 for the Omer 81P but it shaves a lot of time off of the process. 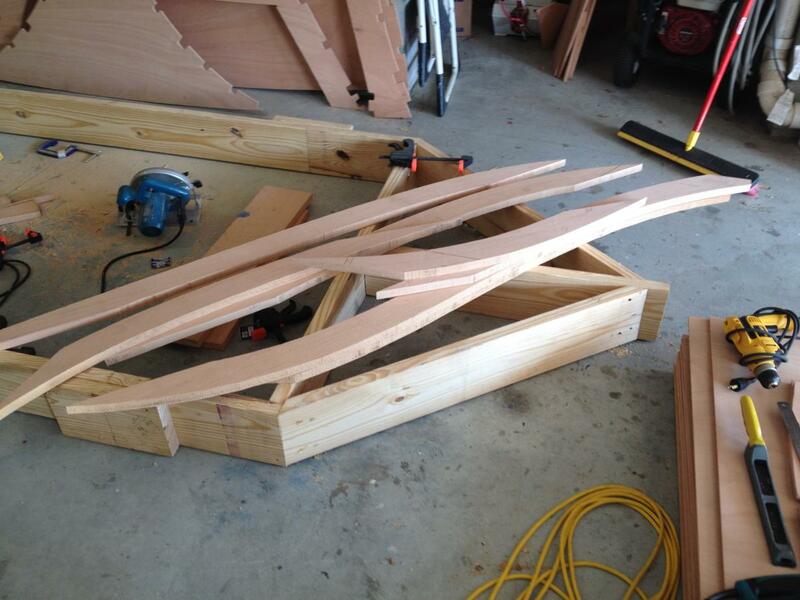 I'm building a boat for the fun of the experience but time is valuable and anything that makes it easier is welcome. 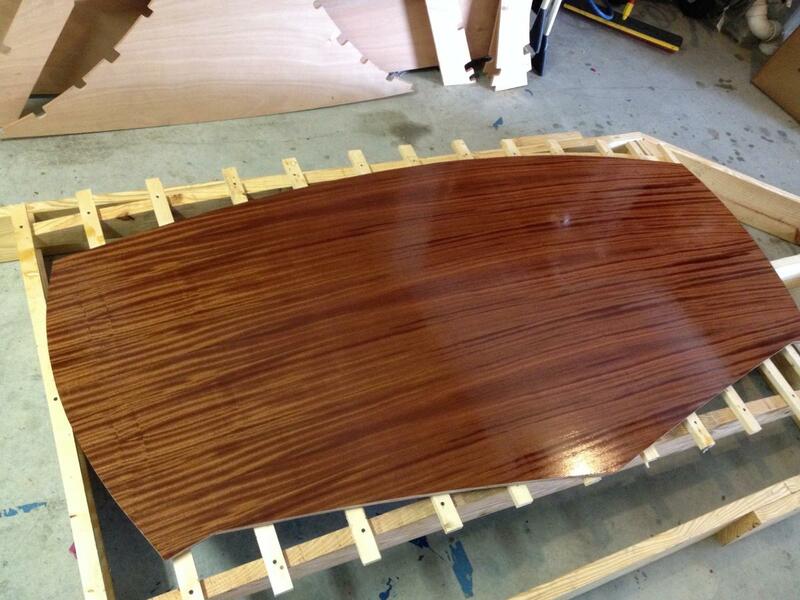 The last boat that I built was cedar veneers over strip planking, 3 layers. I fastened them with regular staples shot through plastic banding used for crate packaging. I pulled out thousands of staples. Some broke but every piece was meticulously removed to prevent rust. I had a steroid injection in my shoulder and 6 weeks of occupational therapy. I'm not doing that again! So far, the $215 is worth it! Staples that are proud sand right off with #40 sandpaper. The one thing that I would say is that I seem to be using a bit more epoxy than usual to make sure that there are no voids. Like Miyot said, you have to lean your weight onto the board to get the compression needed. I give him a lot of credit for doing it all with a manual stapler!